Intro/ribbon drivers | What's Best Audio and Video Forum. The Best High End Audio Forum on the planet! I know some amp guys. I know some source guys. I know some tube guys. (insert comments about needing new friends) Me, I’m a speaker guy. Speaker design has always fascinated me. Unlike the electronics in front of them, you can see a speaker working, breathing, huffing, and sometimes chuffing -- playing (or playing back) music. Pretty animate as far as inanimate objects go. Also unlike electronics, you can see a lot of their design. So many shapes, sizes, types of drivers, crossover choices, materials, bass loading schemes, etc. No other component so directly interacts with the room, and by extension, the people in it. Yeah, every piece matters on the way there, but for me, the piece that turns electricity into music is where the magic finally lies. I’ve been informally educating myself on speaker design since getting a pair of Phase Research Little –Ds in the early 80s. Ribbon tweeter, transmission line loading bracing the cabinet, time phased, front face covered with thin acoustic foam – I’ve got a better idea of what those things mean now and thought it would be fun to start a discussion on speaker design. Caveat: I am absolutely not a speaker engineer or expert – much of what follows is my experience of certain designs and parameters, food for thought that hopefully spurs discussion. I’ll start here with ribbon drivers and add more subjects, such as crossover slopes, controlled directivity, and time phasing down the road. Ribbon: Since those Little Ds, I’ve been a fan of ribbon drivers. Went a long time with domes and cones before returning to ribbon tweeters and mids in my VMPS RM40s, and the Sunfire CRM2s I use for surrounds. Speed, liquidity and transparency are what I find to be most notable with good ribbons – they make most domes seem to be letdowns in my experience. The appeal of ribbon technology is their extremely light weight which should translate into excellent transient performance as well as little or no resonance of consequence to muddle sound. A ribbon tweeter can be up to fifty times lighter than a dome. In relative weight, that’s a tiger versus an elephant. Which one will have an easier time cleanly starting and stopping; tracing fast-changing musical signals? On the downside: ribbons have the reputation of being non-linear, fragile, and power hungry among other maladies. However, advances in materials and fabrication processes, such as neodynium magnets, kapton, and lamination techniques, along with lower prices for some of these have moved ribbon drivers from a niche product to the relatively commonplace. Manufacturers such as Meridian, Verity, Monitor Audio, Aerial, BG/Wisdom, Adam, Aurum Cantus, and others use ribbon drivers, and often in their top line speakers. Now obviously, there are good speakers with both domes and ribbons. My ATC 20-2 actives have a very good-sounding dome. Having said that, a good ribbon tweeter usually sounds more right to me than a good dome. What’s your take? I agree with you about loudspeakers being the thing which interests me most. The other parts of the playback system are typically black boxes lacking the Industrial Design and mystique of speakers (tube amps excluded). Turntables come close in that you can see them spin, but you hear the speaker. I like ribbons very much but they often don't image as well as larger panel type speakers and they have phase issues (almost always). I'm sure with such broad statements I invite some disagreement, I mean no harm. I'm open to learning so educate me. I have not seen nor heard of the Sunfire CRM2 before, looks like a neat little speaker. My Von Schweikert VR-9s, Unifield 3s, LSA1 Statement Monitors and Ambience Reference 1600s all have ribbons. There's just an effortlessness in conveying air that is addicting. I even have Townshend Supertweeters on hand just for play. What I also like about so called line sources is that they are able to deal with room reflections better. And, in case of Wisdom, are shallow enough to put in-wall! Great way to hide the speakers from the front of the room. Nice paper, great information diagram wise on their website. Started out as a single point/dot and grew from there getting into all sorts of reflections. If I'm not mistaken a line source can reflect too, they just don't show that sequence going that far. Yes, that is correct. The difference is that the direct sound is much stronger in planar speakers (by power of 2) due to cylindrical distribution of the waves, vs. sphere for normal speaker. So the reflections play a much smaller role. I still own these.. ribbon twitters can have a very seductive sound. Those diagrams are clever in how they ignore side wall reflections, but you still get more direct vs. reflected sound by minimizing floor and ceiling reflections. 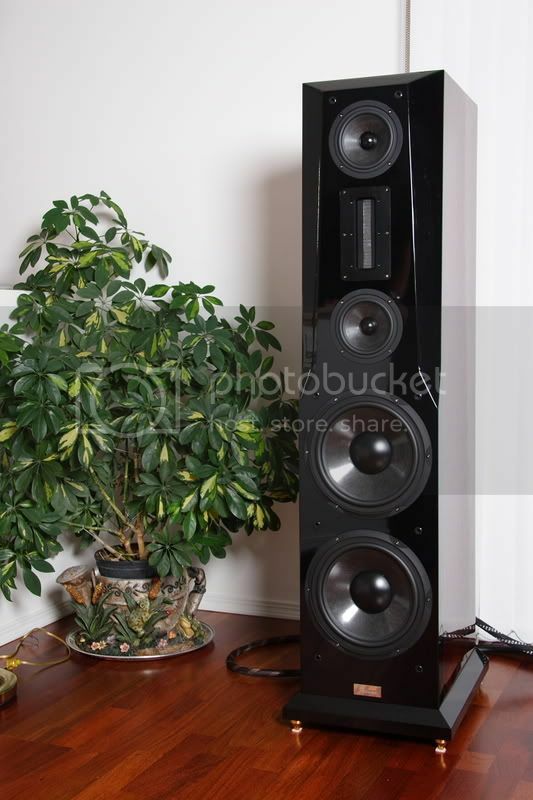 My forthcoming speakers are line arrays -- one of these days they might actually show up at my door. I reviewed some full range ribbons by Analysis Audio awhile ago -- they were excellent, but like a lot of dipoles, I struggled to get them to work right in my room. Those Sunfires are pretty amazing for their size and match well w/my VMPSs. I find them to be nearly perfect surround speakers, partly because they're so easy to place. I'm a longtime fan of controlled directivity speakers, the design goal makes real world sense to me. The Finns have always been big on these, what with Gradient, Amphion, and Genelec to a lesser extent. I know Gradients and Amphions well -- their sound is immediately identifiable by its clear and dimensional midband. I know his is a ribbon thread, so I'm just going to post these several links. If there is interest in talking about them I'll start some new threads. sound wave.I now own a fine speaker that has a cult following in central Europe which i have modded with double panar mids and ribbons. This way i could lower the mid cross point to the TL loaded woofer at 300Hz and gain more body/presence all the way up. My next speaker will be completely diy with arrays for planar mids (LFT-10s)and ribbons (also LFT new neodymium long tweeters),plus double symmetrical TL woofers...I will have the time of my life making it! "Now, what will we do without the barbarians?These people were some kind of a solution..."
which i have modded with double panar mids and ribbons. Do you leave anything stock? What is the name and model of that speaker? George,as you have probably figured out by now,"i don't run stock".And it's fun fun fun all the time! The speaker is the QUADRAL VULKAN MKV which ended it's commercial life at the start of this decade. (neodymium magnets) but they will repair existing ones for life (at a cost).Think of it as a top Piega with guts!It's a speaker to live with,unless you can find this one(500 pairs):http://www.titanstory.de/titan/titan5 which i persuaded a wealthier friend to buy (6500 to 10000 euro, used) or this one http://www.sac.de/sac/Files/Download/Tests/anthaeus_stp0189.pdf. 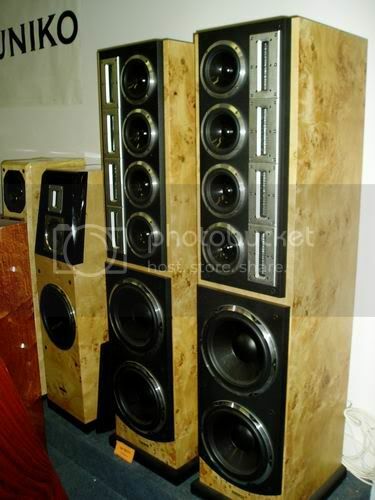 which is a very limited speaker of the 90's (55 pairs) and it's price starts at around 15000 eur R if you are crazy like me,nothing is enough,and you start your own "cost no object" project. Stereoplay for about a decade...I think i have a photo in my other computer. Interesting to see what doesn't make it across the big pond! In that older photo, were you running Sonic Frontiers Power-3's before modifying the Golden Tube Audio SE-100's run in mono? You got them George!Actually this pair belongs to a friend.It not the SE version of the Power-3s and at the time i had only one GTA SE-100.I was thinking about getting me a pair too! Provided that you weren't asking for the 200Watt+ power that the Power-3s could pump -sonic wise it was a tie! The SF was more neutral but the GTA had a more electrifying sound with the spectrum extremes more pronounced. So i decided to bite the bullet,get another one (ahem ...and then another and another and another) modify them extensively,use them as monos and be happy ever after. For the record I have to admit that for the initial purchase amount for the SE-100s plus the money spent on upgrades (remember that i did all the labour!) could probably get me the SE version of the Power-3s ...with a margin. But i have no regrets.I made them as i wanted them and learned a heck about tube gear. The Apogee Scintilla has double naked corrugated aluminum ribbons that run up the five foot speaker and then down the other side giving a bit less that 20' of tweeter per speaker. The tweeter ribbons are .25" wide. There is a 1.5" wide mid range ribbon that runs in the middle of the four runs of tweeter. It takes a mighty amp to make noise, but what a magical noise it is, totally captivating. These ribbons are so fast, there is absolutely no movement noticed at maximum volume. This is with ceramic magnets. Have always wanted to hear those. Did a review of some Analysis Audio ribbons that is as close as I've gotten to that type of design.